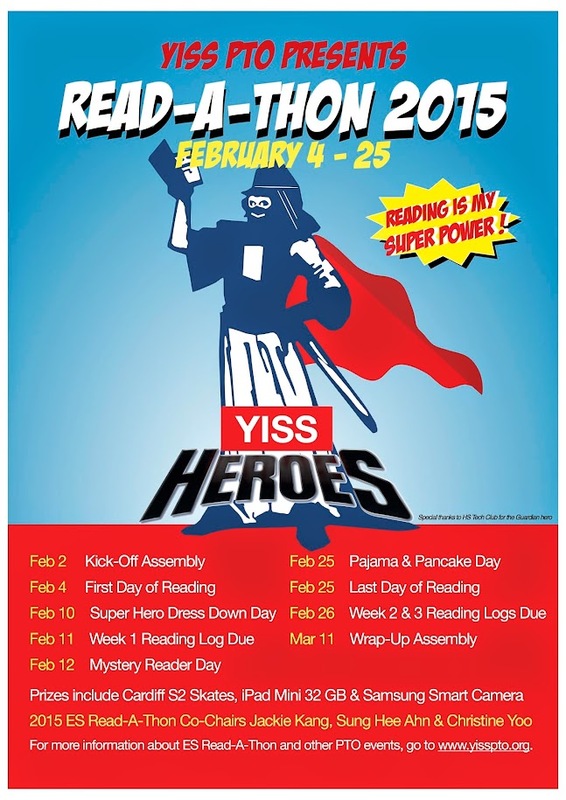 Welcome to our annual celebration of reading, the YISS 2015 Elementary School Read-A-Thon. Our goal is to develop a lifelong love of learning and promote the enjoyment of reading through a variety of fun and educational activities. The theme this year is "Reading is My Super Power"and will begin on Wednesday, February 4 and end on Wednesday, February 25. We want to encourage our children to read joyfully. All the events for this year’s Read-A-Thon circle around the theme, and of course the competition for prizes will be highlighted as well. Like last year there will be a school wide goal for minutes read. If the Elementary School students can collectively read a total of 624,225 minutes, Mrs. Birmingham, Mr. Garman and Mrs. Roll have agreed to the Pie Throw at the Wrap-Up Assembly. All students, teachers, administrative staff and parent volunteers are invited to come to school dressed in their PJs and enjoy a pancake lunch on Wednesday, February 25th. You are welcome to “Snuggle Up and Read” your favorite book that day. For the duration of Read-A-Thon, we are dedicating 20 minutes of every school day to Drop Everything and Read (DEAR). DEAR time is for everyone to read, adults and students in the school community. You can read anything you wish to; books, magazines, comic books, non-fiction, newspapers, etc. These 20 minutes count towards your reading log. All students, teachers, administrators will celebrate the end of Read-A-Thon and if the Elementary School collectively reads 624,225 minutes, Mrs. Birmingham, Mr. Garman and Mrs. Roll have agreed to the Pie throw at the Wrap-Up Assembly. In addition, names will be drawn for Level 2 and 3 prizes.